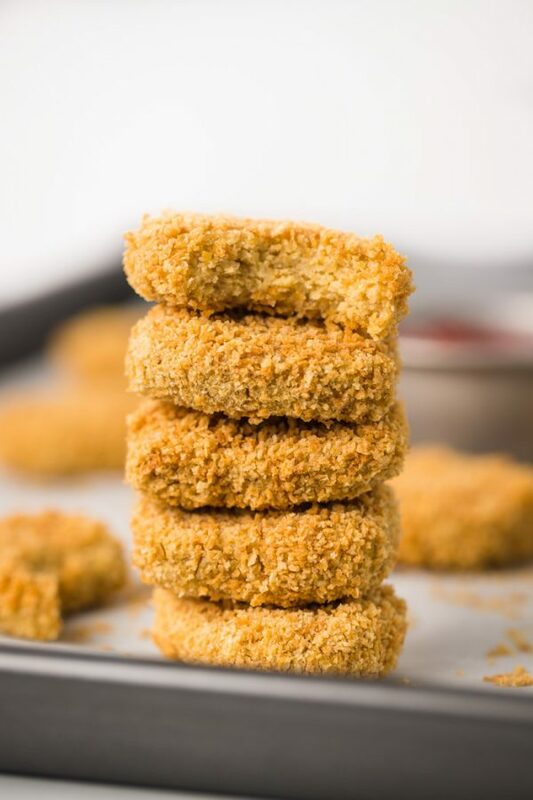 EASY Vegan Chickpea Nuggets- these chickpea nuggets are SO delicious and a fun meat-free meal that the whole family will love! Ever since Jemma started eating solid foods, I’ve been on the hunt for easy and healthy recipes that she can easily feed herself. 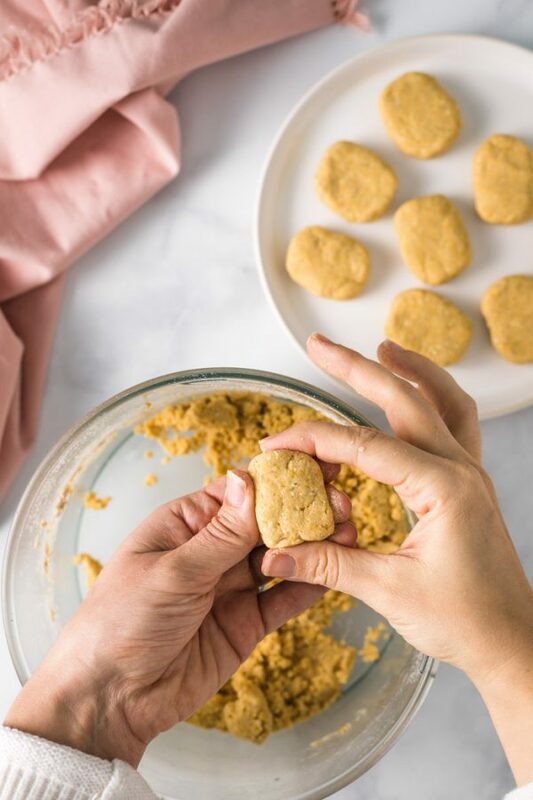 I saw something similar to these chickpea nuggets in the frozen section one day and KNEW that I had to make my own version at home. I’m in love with how these turned out! My goal was to keep these as simple as possible. I debated adding finely diced veggies into the chickpea mixture but decided that I would keep this recipe as basic as I could and maybe later I will create a veggie version (already excited about that!). 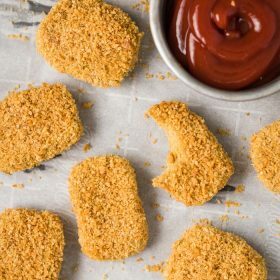 When working on the breading of these Chickpea Nuggets, I wanted an option that would keep these vegan. So, instead of dipping the nuggets in an egg wash before rolling them in the panko, I dipped them into the leftover liquid from the chickpea can. I wasn’t sure how well it would work but it turned out great! 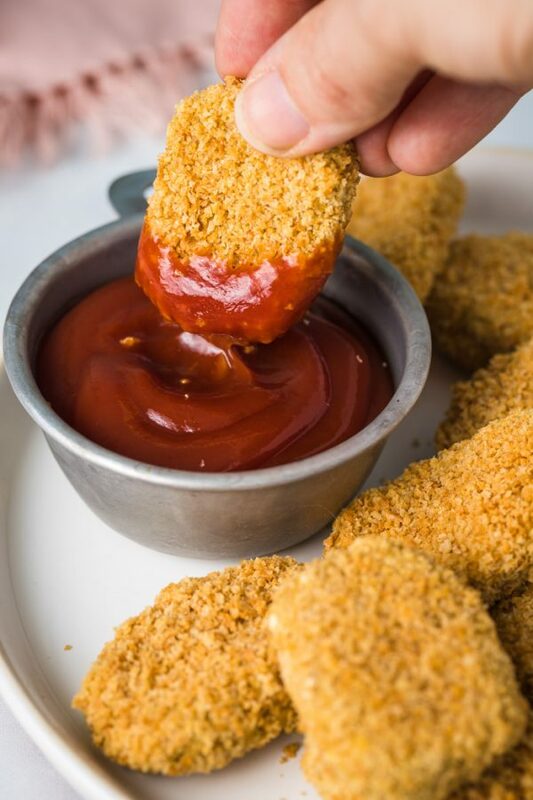 If you aren’t concerned with making these vegan then you can totally use an egg. Another quick tip for you: the recipe calls for oat flour. If you don’t have any on hand, you can simple blend some up yourself as opposed to buying a whole bag of it. Simple add about 2/3 cup of rolled oats to your food processor and blend into a nice fine flour. For this particular recipe, it’s okay if there are still a few small chunks of oat left over. 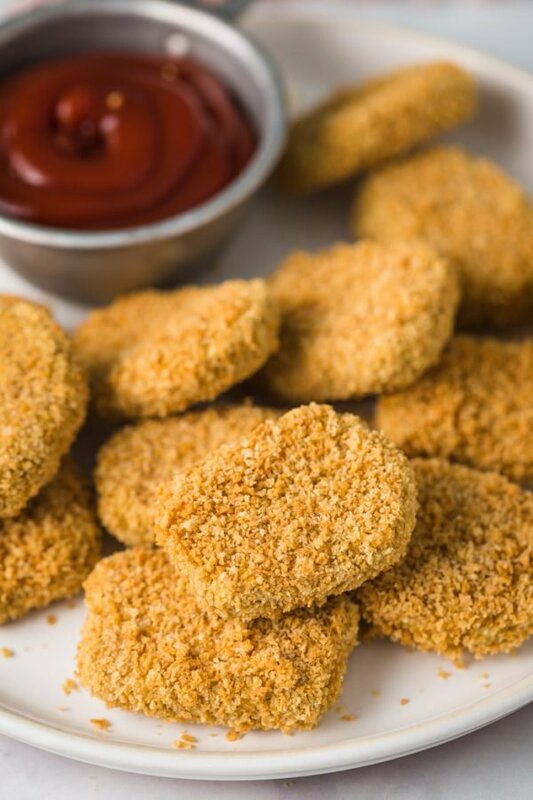 To give the outside of the nuggets a nice golden color, we’ll start by first lightly toasting the panko crumbs. 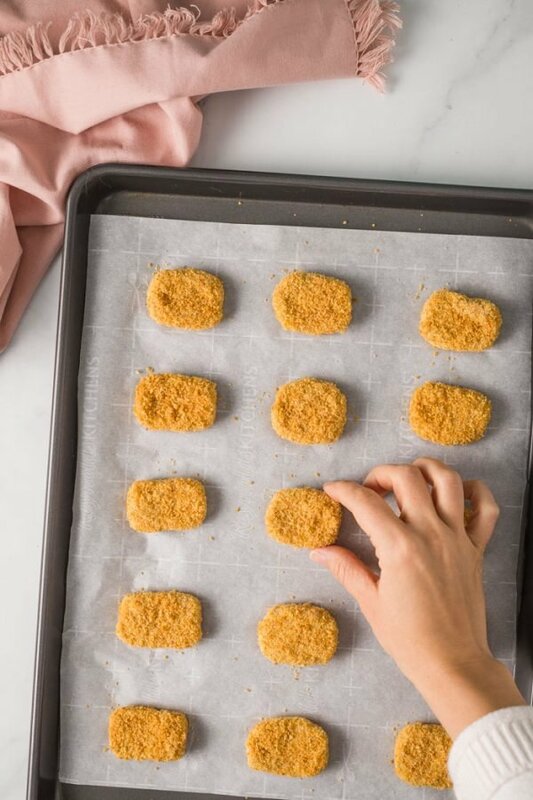 Simply place them on a baking sheet and toast for about 6 minutes, tossing halfway through. Make a flax egg by whisking together 1 tablespoon of flaxseed meal with 2 tablespoons of the chickpea liquid. Next we’ll blend together all of the ingredients in a food processor: chickpeas, oat flour, spices, and the flax meal mixture. The dough is formed into little nuggets. I got about 15 nuggets out of mine. 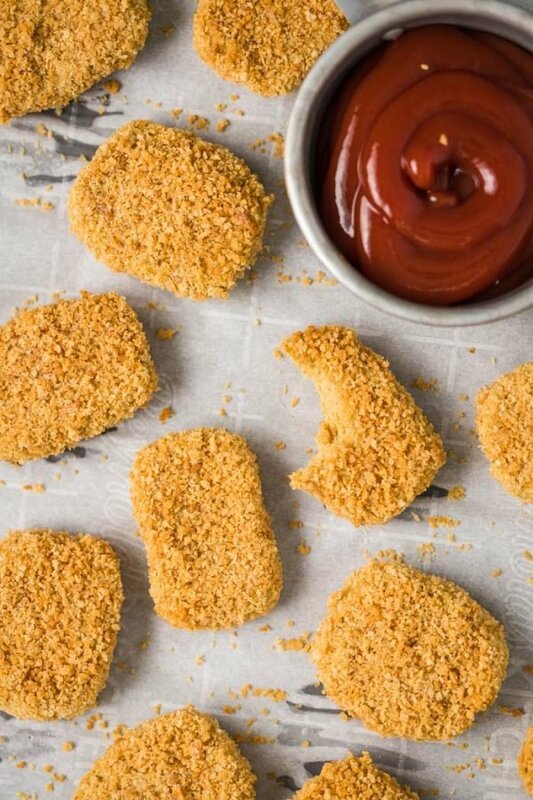 Each nugget is dipped in the leftover liquid from the chickpea can before being rolled in the panko bread crumbs.